This article is about the language historically known as Hindustani, Hindi or Urdu. For Modern Standard Hindi, see Hindi. For Modern Standard Urdu, see Urdu. Hindustani (Hindi: हिन्दुस्तानी,[a] Urdu: ہندوستانی),[b] also known as Hindi-Urdu and historically also known as Hindavi, Dehlavi and Rekhta, is the lingua franca of Northern India and Pakistan. It is an Indo-Aryan language, deriving its base primarily from the Khariboli dialect of Delhi. The language incorporates a large amount of vocabulary from Prakrit, Sanskrit (via Prakrit and Tatsama borrowings), as well as Persian and Arabic (via Persian). It is a pluricentric language, with two official forms, Modern Standard Hindi and Modern Standard Urdu, which are its standardised registers. According to Ethnologue's 2019 estimates, if Hindi and Urdu are taken together as Hindustani, the language would be the 3rd most spoken language in the world, with approximately 409.8 million native speakers and 785.6 million total speakers. The colloquial registers are mostly indistinguishable and even though the official standards are nearly identical in grammar, they differ in literary conventions and in academic and technical vocabulary, with Urdu adopting stronger Persian and Arabic influences, and Hindi relying more heavily on Sanskrit. Before the partition of India, the terms Hindustani, Hindi and Urdu were synonymous; they all covered what would be mostly called Hindi and Urdu today. The term Hindustani is still used for the colloquial language and the lingua franca of North India and Pakistan, for example for the language of Bollywood films, as well as for several languages of the Hindi-Urdu belt spoken outside the Indian subcontinent, such as Fijian Hindi of Fiji and the Caribbean Hindustani of Trinidad and Tobago, Guyana, Suriname, and the rest of the Caribbean. Hindustani is also spoken by a small number of people in Mauritius and South Africa. 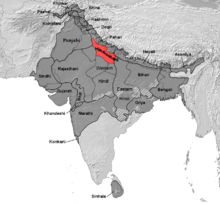 Early forms of present-day Hindustani developed from the Middle Indo-Aryan apabhraṃśa vernaculars of present-day North India in the 7th–13th centuries. Amir Khusrow, who lived in the thirteenth century during the Delhi Sultanate period in North India, used these forms (which was the lingua franca of the period) in his writings and referred to it as Hindavi (Persian: ھندوی‎ literally "of Hindus or Indians"). The Delhi Sultanate, which comprised several Turkic and Afghan dynasties that ruled from Delhi, was succeeded by the Mughal Empire in 1526. Although the Mughals were of Timurid (Gurkānī) Turco-Mongol descent, they were Persianised, and Persian had gradually become the state language of the Mughal empire after Babur, a continuation since the introduction of Persian by Central Asian Turkic rulers in the Indian Subcontinent, and the patronisation of it by the earlier Turko-Afghan Delhi Sultanate. The basis in general for the introduction of Persian into the subcontinent was set, from its earliest days, by various Persianised Central Asian Turkic and Afghan dynasties. In the 18th century, towards the end of the Mughal period, with the fragmentation of the empire and the elite system, a variant of Khariboli, one of the successors of apabhraṃśa vernaculars at Delhi, and nearby cities, came to gradually replace Persian as the lingua franca among the educated elite upper class particularly in northern India, though Persian still retained much of its pre-eminence for a short period. The term Hindustani was given to that language evolved out of Khariboli. For socio-political reasons, though essentially the variant of Khariboli with Persian vocabulary, the emerging prestige dialect became also known as Zabān-e Urdū-e Mualla "language of the court" or Zabān-e Urdū زبان اردو‎, ज़बान-ए उर्दू, "language of the camp" in Persian, derived from Turkic Ordū "camp", cognate with English horde, due to its origin as the common speech of the Mughal army). The more highly Persianised version later established as a language of the court was called Rekhta, or "mixed". As an emerging common dialect, Hindustani absorbed large numbers of Persian, Arabic, and Turkic words, and as Mughal conquests grew it spread as a lingua franca across much of northern India. 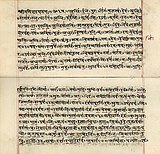 Written in the Persian alphabet or Devanagari, it remained the primary lingua franca of northern India for the next four centuries (although it varied significantly in vocabulary depending on the local language) and achieved the status of a literary language, alongside Persian, in Muslim courts. Its development was centred on the poets of the Mughal courts of cities in Uttar Pradesh such as Delhi, Lucknow, and Agra. John Fletcher Hurst in his book published in 1891 mentioned that the Hindustani or camp language of the Mughal Empire's courts at Delhi was not regarded by philologists as distinct language but only as a dialect of Hindi with admixture of Persian. He continued: "But it has all the magnitude and importance of separate language. It is linguistic result of Muslim rule of eleventh & twelfth centuries and is spoken (except in rural Bengal) by many Hindus in North India and by Musalman population in all parts of India". Next to English it was the official language of British Raj, was commonly written in Arabic or Persian characters, and was spoken by approximately 100,000,000 people. When the British colonised the Indian subcontinent from the late 18th through to the late 19th century, they used the words 'Hindustani', 'Hindi' and 'Urdu' interchangeably. They developed it as the language of administration of British India, further preparing it to be the official language of modern India and Pakistan. However, with independence, use of the word 'Hindustani' declined, being largely replaced by 'Hindi' and 'Urdu', or 'Hindi-Urdu' when either of those was too specific. More recently, the word 'Hindustani' has been used for the colloquial language of Bollywood films, which are popular in both India and Pakistan and which cannot be unambiguously identified as either Hindi or Urdu. Although, at the spoken level, Hindi and Urdu are considered registers of a single language, they differ vastly in literary and formal vocabulary; where literary Hindi draws heavily on Sanskrit and to a lesser extent Prakrit, literary Urdu draws heavily on Persian and Arabic. The grammar and base vocabulary (most pronouns, verbs, adpositions, etc.) of both Hindi and Urdu, however, are the same and derive from a Prakritic base, and both have Persian/Arabic influence. The standardised registers Hindi and Urdu are collectively known as Hindi-Urdu. Hindustani is perhaps the lingua franca of the north and west of the Indian subcontinent, though it is understood fairly well in other regions also, especially in the urban areas. A common vernacular sharing characteristics with Sanskritised Hindi, regional Hindi and Urdu, Hindustani is more commonly used as a vernacular than highly Sanskritised Hindi or highly Arabicised/Persianised Urdu. This can be seen in the popular culture of Bollywood or, more generally, the vernacular of North Indians and Pakistanis, which generally employs a lexicon common to both Hindi and Urdu speakers. Minor subtleties in region will also affect the 'brand' of Hindustani, sometimes pushing the Hindustani closer to Urdu or to Hindi. One might reasonably assume that the Hindustani spoken in Lucknow, Uttar Pradesh (known for its usage of Urdu) and Varanasi (a holy city for Hindus and thus using highly Sanskritised Hindi) is somewhat different. the more formal neutralised form of Hindustani used in television and print news reports. Urdu is the national language of Pakistan and an officially recognised regional language of India. Urdu is the official language of all Pakistani provinces and is taught in all schools as a compulsory subject up to the 12th grade. In a specific sense, Hindustani may be used to refer to the dialects and varieties used in common speech, in contrast with the standardised Hindi and Urdu. This meaning is reflected in the use of the term bazaar Hindustani, in other words, the "language of the street or the marketplace", as opposed to the perceived refinement of formal Hindi, Urdu, or even Sanskrit. Amir Khusro ca. 1300 referred to this language of his writings as Dehlavi (देहलवी; دہلوی 'of Delhi') or Hindavi (हिन्दवी; ہندوی). During this period, Hindustani was used by Sufis in promulgating their message across the Indian subcontinent. After the advent of the Mughals in the subcontinent, Hindustani acquired more Persian loanwords. Rekhta ('mixture') and Hindi ('of the Indus') became popular names for the same language until the 18th century. The name Urdu (from Ordu or Orda) appeared around 1780. During the British Raj, the term Hindustani was used by British officials. In 1796, John Borthwick Gilchrist published a "A Grammar of the Hindoostanee Language". Upon partition, India and Pakistan established national standards that they called Hindi and Urdu, respectively, and attempted to make distinct, with the result that Hindustani commonly, but mistakenly, came to be seen as a mixture of Hindi and Urdu. We may now define the three main varieties of Hindōstānī as follows:—Hindōstānī is primarily the language of the Upper Gangetic Doab, and is also the lingua franca of India, capable of being written in both Persian and Dēva-nāgarī characters, and without purism, avoiding alike the excessive use of either Persian or Sanskrit words when employed for literature. 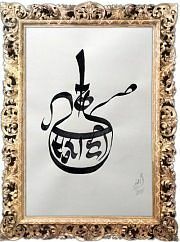 The name 'Urdū' can then be confined to that special variety of Hindōstānī in which Persian words are of frequent occurrence, and which hence can only be written in the Persian character, and, similarly, 'Hindī' can be confined to the form of Hindōstānī in which Sanskrit words abound, and which hence can only be written in the Dēva-nāgarī character. Hindustani, in its standardised registers, is one of the official languages of both India (Hindi) and Pakistan (Urdu). Hindi, a major standardized register of Hindustani, is declared by the Constitution of India as the "official language (राजभाषा, rājabhāśā) of the Union" (Art. 343(1)) (In this context, "Union" means the Federal Government and not the entire country – India has 23 official languages). At the same time, however, the definitive text of federal laws is officially the English text and proceedings in the higher appellate courts must be conducted in English. At the state level, Hindi is one of the official languages in 9 of the 29 Indian states and three Union Territories (respectively, Uttar Pradesh, Bihar, Jharkhand, Uttarakhand, Madhya Pradesh, Rajasthan, Chhattisgarh, Himachal Pradesh, and Haryana; Delhi, Chandigarh, and the Andaman and Nicobar Islands). In the remaining states Hindi is not an official language. In states like Tamil Nadu and Karnataka, studying Hindi is not compulsory in the state curriculum. However an option to take the same as second or third language does exist. In many other states, studying Hindi is usually compulsory in the school curriculum as a third language (the first two languages being the state's official language and English), though the intensiveness of Hindi in the curriculum varies. Urdu, also a major standardized register of Hindustani, is also one of the languages recognized in the Eighth Schedule to the Constitution of India and is an official language of the Indian states of Telangana, Bihar, Delhi, Jammu and Kashmir, and Uttar Pradesh. Although the government school system in most other states emphasises Modern Standard Hindi, at universities in cities such as Lucknow, Aligarh and Hyderabad, Urdu is spoken and learnt, and Saaf or Khaalis Urdu is treated with just as much respect as Shuddha Hindi. Urdu is also the national language of Pakistan, where it shares official language status with English. Although English is spoken by many, and Punjabi is the native language of the majority of the population, Urdu is the lingua franca. Hindustani was the official language of the British Raj and was synonymous with both Hindi and Urdu. After India's independence in 1947, the Sub-Committee on Fundamental Rights recommended that the official language of India be Hindustani: "Hindustani, written either in Devanagari or the Perso-Arabic script at the option of the citizen, shall, as the national language, be the first official language of the Union." However, this recommendation was not adopted by the Constituent Assembly. 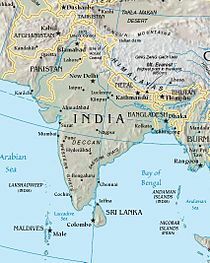 Besides being the lingua franca of North India and Pakistan in South Asia, Hindustani is also spoken by many in the South Asian diaspora and their descendants around the world, including North America (in Canada, for example, Hindustani is one of the fastest growing languages), Europe, and the Middle East. Fiji Hindi was derived from the Hindustani linguistic group and is spoken widely by Fijians of Indian origin. Hindustani was also one of the languages that was spoken widely during British rule in Burma. Many older citizens of Myanmar, particularly Anglo-Indians and the Anglo-Burmese, still know it, although it has had no official status in the country since military rule began. Hindustani is also spoken in the countries of the Gulf Cooperation Council, where migrant workers from various countries live and work for several years. Hindustani contains around 5,500 words of Persian and Arabic origin. Historically, Hindustani was written in the Kaithi, Devanagari, and Urdu alphabets. Kaithi and Devanagari are two of the Brahmic scripts native to India, whereas Urdu is a derivation of the Persian Nastaʿlīq script, which is the preferred calligraphic style for Urdu. Today, Hindustani continues to be written in the nastaliq alphabet in Pakistan. In India, the Hindi register is officially written in Devanagari, and Urdu in the nastaliq alphabet, to the extent that these standards are partly defined by their script. However, in popular publications in India, Urdu is also written in Devanagari, with slight variations to establish a Devanagari Urdu alphabet alongside the Devanagari Hindi alphabet. Because of anglicisation in South Asia and the international use of the Latin script, Hindustani is occasionally written in the Latin script. This adaptation is called Roman Urdu or Romanised Hindi, depending upon the register used. Because the Bollywood film industry is a major proponent of the Latin script, the use of Latin script to write in Hindi and Urdu is growing amongst younger Internet users. Since Urdu and Hindi are mutually intelligible when spoken, Romanised Hindi and Roman Urdu (unlike Devanagari Hindi and Urdu in the Urdu alphabet) are mutually intelligible as well. Following is a sample text, Article 1 of the Universal Declaration of Human Rights, in the two official registers of Hindustani, Hindi and Urdu. Because this is a formal legal text, differences in formal vocabulary are maximised. Anucched 1: Sabhī manushyoṇ ko gaurav aur adhikāroṇ ke vishay meṇ janm'jāt svatantratā prāpt haiṇ. Unheṇ buddhi aur antarātmā kī den prāpt hai aur paraspar unheṇ bhāīchāre ke bhāv se bartāv karnā chāhiye. Article 1—All human-beings to dignity and rights' matter in from-birth freedom acquired is. Them to reason and conscience's endowment acquired is and always them to brotherhood's spirit with behaviour to do should. Article 1—All human beings are born free and equal in dignity and rights. They are endowed with reason and conscience and should act towards one another in a spirit of brotherhood. Article 1: All humans free[,] and rights and dignity's consideration from equal born are. To them conscience and intellect endowed is. Therefore, they one another's with brotherhood's treatment do must. Article 1—All human beings are born free and equal in dignity and rights. They are endowed with reason and conscience. Therefore, they should act towards one another in a spirit of brotherhood. The predominant Indian film industry Bollywood, located in Mumbai, Maharashtra uses Hindi, Khariboli dialect, Bombay Hindi, Urdu, Awadhi, Rajasthani, Bhojpuri, and Braj Bhasha, along with the language of Punjabi and with the liberal use of English or Hinglish for the dialogue and soundtrack lyrics. Movie titles are often screened in three scripts: Latin, Devanagari and occasionally Perso-Arabic. The use of Urdu or Hindi in films depends on the film's context: historical films set in the Delhi Sultanate or Mughal Empire are almost entirely in Urdu, whereas films based on Hindu mythology or ancient India make heavy use of Hindi with Sanskrit vocabulary. ^ Takkar, Gaurav. "Short Term Programmes". punarbhava.in. ^ "National Council for Promotion of Urdu Language". www.urducouncil.nic.in. ^ Hammarström, Harald; Forkel, Robert; Haspelmath, Martin, eds. (2017). "Hindustani". Glottolog 3.0. Jena, Germany: Max Planck Institute for the Science of Human History. ^ "About Hindi-Urdu". North Carolina State University. Archived from the original on 15 August 2009. Retrieved 9 August 2009. ^ Kachru, Yamuna (2006). Hindi. John Benjamins Publishing. p. 2. ISBN 978-90-272-3812-2. ^ Gat, Azar; Yakobson, Alexander (2013). Nations: The Long History and Deep Roots of Political Ethnicity and Nationalism. Cambridge University Press. p. 126. ISBN 978-1-107-00785-7. ^ Zahir ud-Din Mohammad (10 September 2002), Thackston, Wheeler M. (ed. ), The Baburnama: Memoirs of Babur, Prince and Emperor, Modern Library Classics, ISBN 978-0-375-76137-9, Note: Gurkānī is the Persianized form of the Mongolian word "kürügän" ("son-in-law"), the title given to the dynasty's founder after his marriage into Genghis Khan's family. ^ "Timurids". The Columbia Encyclopedia (Sixth ed.). New York City: Columbia University. Archived from the original on 5 December 2006. Retrieved 8 November 2006. ^ Encyclopædia Britannica article: Consolidation & expansion of the Indo-Timurids, Online Edition, 2007. ^ Bennett, Clinton; Ramsey, Charles M. (2012). South Asian Sufis: Devotion, Deviation, and Destiny. A&C Black. p. 18. ISBN 978-1-4411-5127-8. ^ Laet, Sigfried J. de Laet (1994). History of Humanity: From the seventh to the sixteenth century. UNESCO. p. 734. ISBN 978-92-3-102813-7. ^ a b c Pollock, Sheldon (2003). Literary Cultures in History: Reconstructions from South Asia. University of California Press. p. 912. ISBN 978-0-520-22821-4. ^ Hurst, John Fletcher (1992). Indika, The country and People of India and Ceylon. Concept Publishing Company. p. 344. GGKEY:P8ZHWWKEKAJ. ^ a b Coulmas, Florian (2003). Writing Systems: An Introduction to Their Linguistic Analysis. Cambridge University Press. p. 232. ISBN 978-0-521-78737-6. ^ Bahri (13 February 1989). "Learners' Hindi-English Dictionary". dsalsrv02.uchicago.edu. ^ "The Origin and Growth of Urdu Language". Yaser Amri. Retrieved 8 January 2007. ^ a b c d Faruqi, Shamsur Rahman (2003), "A Long History of Urdu Literarature, Part 1", Literary cultures in history: reconstructions from South Asia, p. 806, ISBN 978-0-520-22821-4 in Pollock (2003). ^ Grierson, vol. 9–1, p. 47. ^ Government of India: National Policy on Education Archived 20 June 2006 at the Wayback Machine. ^ Lelyveld, David (1993). "Colonial Knowledge and the Fate of Hindustani". Comparative Studies in Society and History. 35 (4): 665–682. JSTOR 179178. ^ Coward, Harold (2003). Indian Critiques of Gandhi. SUNY Press. p. 218. ISBN 978-0-7914-5910-2. ^ "Hindi, not a national language: Court". The Hindu. 25 January 2010. ^ "Census data shows Canada increasingly bilingual, linguistically diverse". ^ Kuczkiewicz-Fraś, Agnieszka (2008). Perso-Arabic Loanwords in Hindustani. Kraków: Księgarnia Akademicka. p. x. ISBN 978-83-7188-161-9. ^ "Decoding the Bollywood poster". National Science and Media Museum. 28 February 2013. Asher, R.E. (1994). Hindi. In Asher (Ed.) (pp. 1547–1549). Asher, R.E. (Ed.). (1994). The Encyclopedia of language and linguistics. Oxford: Pergamon Press. ISBN 0-08-035943-4. Bailey, Thomas G. (1950). Teach yourself Hindustani. London: English Universities Press. Chatterji, Suniti K. (1960). Indo-Aryan and Hindi (rev. 2nd ed.). Calcutta: Firma K.L. Mukhopadhyay. Dua, Hans R. (1992). Hindi-Urdu as a pluricentric language. In M.G. Clyne (Ed. ), Pluricentric languages: Differing norms in different nations. Berlin: Mouton de Gruyter. ISBN 3-11-012855-1. Dua, Hans R. (1994a). Hindustani. In Asher (Ed.) (pp. 1554). Dua, Hans R. (1994b). Urdu. In Asher (Ed.) (pp. 4863–4864). Rai, Amrit. (1984). A house divided: The origin and development of Hindi-Hindustani. Delhi: Oxford University Press. ISBN 0-19-561643-X. Duncan Forbes (1857). A dictionary, Hindustani and English, accompanied by a reversed dictionary, English and Hindustani. archive.org (2nd ed.). London: Sampson Low, Marston & Company. p. 1144. OCLC 1043011501. Archived from the original on 18 October 2018. Retrieved 18 October 2018. Wikivoyage has a travel guide for Hindi-Urdu_phrasebook. Wikisource has the text of the 1911 Encyclopædia Britannica article Hindostani.